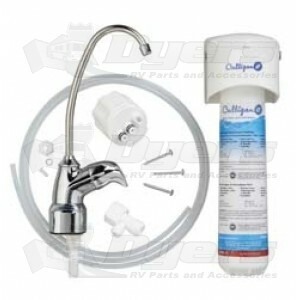 Enjoy clear, clean drinking and cooking water on the road in your RV! No more struggles with fittings, water buckets or dirty filters – just twist off the old cartridge and twist on the new one with “no leak” inlet & outlet check valves. Reduces lead, cysts, lindane, atrazine, volatile organic chemicals, mercury, chlorine, bad taste and odor. Filter head, lead-free chrome faucet with built-in electronic cartridge life indicator (battery included), disposable cartridge, winterization by pass fitting, water supply adapter, mounting screws/hardware, ¼” plastic tubing and instructions.